Castleford Tigers’ Peter Mata’utia has declared his ambition to make himself the best full-back in Super League in 2019. After signing for Castleford late in the 2018 season Mata’utia impressed fans and the coaching staff, but believes he can play better and intends to prove it. He told the Express: “I honestly want to be the best full-back in the comp this year. “There’s s lot of good full-backs in Super League and some of the best in the world so it’s going to be a great challenge for me and I’m looking forward to it. “I’m getting used to the structure that we play, I don’t have any excuse not to know my role and I’ll definitely be a lot better this year. “I think I have a lot more to offer, especially getting to know the boys more. I like to get better each week. Mata’utia admitted he was in a better frame of mind to concentrate on his rugby this year after difficulties last year that fans were not aware of. He said: “I came in late into the season last year and I didn’t think I was as good as I could have been. “Mentally off the field I was in the best shape, but I’ve freshened up this year, I’m mentally right and really looking forward to the season. It’s good just to concentrate on rugby. “It was tough what happened at Leigh and only having a day-a-and-a-half to sort out a contract. “And then I had to wait on results on whether my son had cancer or not. “I kept it quiet from these boys, but when it got a bit much Powelly let me off a few sessions. Credit to the coaching staff and the club for the way they helped me when I needed some time away to get my son to hospital. 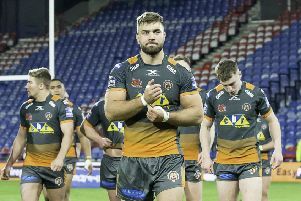 Mata’utia believes he has settled into life at Castleford and has been impressed by the support he has received round the town. He added: “I feel like I’m fitting in pretty well at Cas. “I made a lot of my goals to get my combinations sorted out with Truey, Galey, Jamie and Benny or whoever’s in the halves. I’ve been working hard and also I’ve been trying to take a bit of the leadership role as well. “I love it at Castleford. The culture of the club’s good, the coaching staff’s good and it’s a club heading in the right direction. “I’m actually blessed to be at a club like this. “Everyone in the town loves their rugby. They work hard and spend their extra bit of money to come and watch us play, which means a lot to us boys. “When the fans get behind us it helps us in games so I’m looking forward to seeing them all again. “They are supportive round the town and it will be good to give them something back. “My little boy just started school in Cas this year and he said there were so many Cas photos in his classroom.